O my masters, sons of the Messenger of Allah, I your servant and the son of your maid who stand submissively before you, who is worth nothing in comparison with your elevated esteem, and who admits your right (that is incumbent upon us) have come to you, seeking your shelter, heading for your sanctuary, seeking nearness to Your statuses, and beseeching Allah in your names. May I enter, O my masters? May I enter, O intimate servants of Allah? May I enter, O Allah’s angels who surround this sanctuary and reside in this shrine? Allah is greatly the Greatest. All praise be to Allah abundantly. Glory be to Allah in morns and eves. All praise be to Allah, the Single, the Absolute, the Glorious, the One and Only, the All-obliging, the All-benefactor, the Donor, the All-compassionate, Who conferred (upon us) with His bequests, Who has made easy for me to visit my masters out of His beneficence, Who has not included me with those who are prevented from visiting them; rather, He has bestowed upon me and donated me (this favor). Peace be upon you, O Leaders of true guidance. Peace be upon you, O people of piety. Peace be upon you, O Arguments against the inhabitants of this world. Peace be upon you, O maintainers of justice on people. Peace be upon you, O choicest people. Peace be upon you, O members of the Household of Allah’s Messenger. Peace be upon you, O people of confidential talks (of the angels). I bear witness that you did convey, offer advice, endure for the sake of Allah, and forgive when you were belied and maltreated. I also bear witness that you are the orthodox, well-guided Leaders, that the obedience to you is obligatory, that your words are true, that you had called (to Allah) but you were not answered, that you had enjoined (the right) but you were not obeyed, and that you are the supports of the religion and the poses of the earth. You were always under the sight of Allah Who moved you from the loins of purified men to the wombs of purified women. The benighted ignorance could not stain you and the whimsical sedition could not attract you. Pleased be you as your origin has been pleased. The King of the religion has conferred upon us with the grace of our acknowledgment of you; He therefore caused you to be in houses which He (i.e. Allah) has permitted to be exalted and that His Name may be mentioned therein, and He has decided our invocations of blessings upon you to be mercy on us and to be granting remission of our sins. Allah has chosen you for us and has purified our creation through the grace of our loyalty to your (Divinely commissioned) Leadership with which He has conferred upon us. We have thus become nominated with Him due to our acknowledgement of you and our giving credence to you. So, this is the situation of him who has committed mistakes and sins, shown submission (to you), and confessed of what he had committed. Hence, being in this situation, I hope for redemption and I hope that the Savior of the perishing ones from perdition may save me in your names. So, (please) be my interceders, for I have come to you when the people of this world abandoned you, took the Signs of Allah for a jest, and turned away from them haughtily. O He Who is Self-Subsisting and never forgets, Who is Ever-living and never becomes heedless, and Who encompasses all things! To You is all gratitude for that You have guided me (to this) and You have introduced to me that on which I rest, when Your servants diverted from it, ignored the recognition of it, belittled its right, and inclined to elsewhere. Hence, You have conferred upon me with this favor as well as upon other people whom You have granted exclusively the same. So, all praise be to You, for I have been mentioned and written with You due to the situation in which I am now. Hence, (please) do not deprive me of what I long for, and do not disappoint me as regards my supplication; (please do so) in the name of the sanctity of Muhammad and his immaculate Household. May Allah send blessings upon Muhammad and the Household of Muhammad. السَّلامُ عَلَیْكَ أَیُّهَا الإِمَامُ الصَّادِقُ. السَّلامُ عَلَیْكَ أَیُّهَا الوَصِیُّ النَّاطِقُ. السَّلامُ عَلَیْكَ أَیُّهَا الفَاتِقُ الرَّاتِقُ. السَّلامُ عَلَیْكَ أَیُّهَا السَّنَامُ الأَعْظَمُ. السَّلامُ عَلَیْكَ أَیُّهَا الصِّرَاطُ الأَقْوَمُ. السَّلامُ عَلَیْكَ یَا مِفْتَاحَ الخَیْرَاتِ. السَّلامُ عَلَیْكَ یَا مَعْدِنَ البَرَكَاتِ. السَّلامُ عَلَیْكَ یَا صَاحِبَ الحُجَجِ وَالدَّلالاتِ. السَّلامُ عَلَیْكَ یَا صَاحِبَ البَرَاهِینِ الوَاضِحَاتِ. السَّلامُ عَلَیْكَ یَا نَاصِرَ دِینِ اللَّهِ. السَّلامُ عَلَیْكَ یَا نَاشِرَ حُكْمِ اللَّهِ. السَّلامُ عَلَیْكَ یَا فَاصِلَ الخِطَابَاتِ. السَّلامُ عَلَیْكَ یَا كَاشِفَ الكُرُبَاتِ. السَّلامُ عَلَیْكَ یَا عَمِیدَ الصَّادِقِینَ. السَّلامُ عَلَیْكَ یَا لِسَانَ النَّاطِقِینَ. السَّلامُ عَلَیْكَ یَا خَلَفَ الخَائِفِینَ. السَّلامُ عَلَیْكَ یَا زَعِیمَ الصَّالِحِینَ. السَّلامُ عَلَیْكَ یَا سَیِّدَ المُسْلِمِینَ. السَّلامُ عَلَیْ. یَا كَهْفَ المُؤْمِنِینَ. السَّلامُ عَلَیْكَ یَا هَادِیَ المُضِلِّینَ. السَّلامُ عَلَیْكَ یَا سَكَنَ الطَّائِعِینَ. وَصَلَّى اللَّهُ عَلَى رُوحِكَ وَبَدَنِكَ. ASSALAAMO A'LAYKA YAA A'BBAASUBNO A'BDIL MUTTALEBE ASSALAAMO A'LAYKA YAA A'MMA RASOOLIL LAAHE ASSALAAMO A'LAYKA YAA SAAHEBAS SEQAAYATE WA RAHMATUL LAAHE WA BARAKAATOHU. ASSALAAMO A'LAA NABIYYIL LAAHE ASSALAAMO A'LAA RASOOLIL LAAHE ASSALAAMO A'LAA MOHAMMADIN SAYYEDIL MURSALEENA ASSALAAMO A'LA MOHAMMADIN SAYYEDIL AWWALEENA ASSALAAMO A'LAA MOHAMMADIN SAYYEDIL AAKHEREENA ASSALAAMO A'LAA MAN BA-A'SAHUL LAAHO RAHMATAN LIL-A'ALAMEENA ASSALAAMO A'LAYKA AYYOHAN NABIYYO WA RAHMATUL LAAHE WA BARAKAATOHU ASSALAAMO A'LAA FAATEMATA BINTE ASADENIL HAASHEMIYYATE ASSALAAMO A'LAYKE AYYATOHS SIDDEEQATUL MARZIYYATO ASSALAAMO A'LAYKE AYYATOHAT TAQIYYATUN NAQIYYATO ASSALAAMO A'LAYKE AYYATOHAL KAREEMATUR RAZIYYATO ASSALAAMO A'LAYKE YAA KAAFELATA MOHAMMADIN KHAATAMIN NABIYYEENA ASSALAAMO A'LAYKA YAA WAALEDATA SAYYEDIL WASIYYEENA ASSALAAMO A'LAYKA YAA MAN ZAHARAT SHA-FA-QATOHAA A'LAA RASOOLIL LAAHE KHATAMIN NABIYYEENA ASSALAAMO A'LAYKA YAA MAN TARBEYATOHAA LE-WALIYYIL LAAHILAMEENE ASSALAAMO A'LAYKE WA A'LAA ROOHEKE WA BADANEKIT TA. Then say two rak`ats of pilgrimage prayer and pray for anything you wish. Then leave. Aqeel and Jafar at-Tayyar, both are the brothers of Hazrat Ali (a.s.). Abdullah bin Jafar Tayyar was the husband of Lady Zainab. The graves of these two personalities are in Baqee. 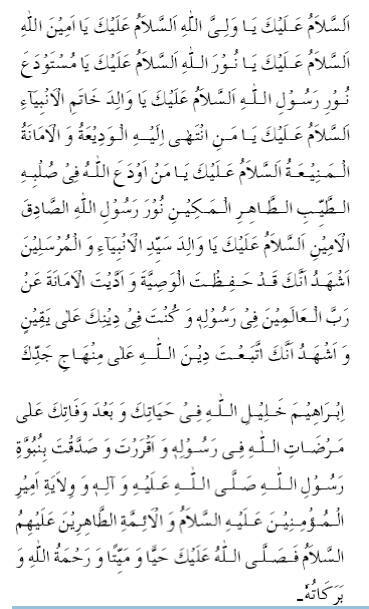 Recite the Ziarat of these noble personages in the following words: ASSALAAMO A'LAYKA YAA SAYYEDANAA YAA A'QEELABNA ABEE TAALEBIN ASSALAAMO A'LAYKA YABNA A'MME RASOOLIL LAAHE ASSALAAMO A'LAYKA YABNA A'MME NABIYYIL LAAHE ASSALAAMO A'LAYKA YABNA A'MME HABEEBIL LAAHE ASSALAAMO A'LAYKA YABNA A'MMIL MUSTAFAA ASSALAAMO A'LAYKA YAA AKHAA A'LIYYENIL MURTAZAA ASSALAAMO A'LAA A'BDIL LAAHIBNE JA'FARIT TAYYARE FIL JENAANE WA A'LAA MAN HAWLAKOMAA MIN ASHAABE RASOOLIL LAAHE RAZEYAL LAAHO TA-A'ALAA A'NKUM WA ARZAAKUM AHSANAR REZAA WA JA-A'LAL JANNATA MANZELAKUM WA MASKANAKUM WA MAHALLAKUM WA MAAWAAKUM ASSALAAMO A'LAYKUM WA RAHMATUL LAAHE WA BARAKAATOHU. ASSALAAMO A'LAA RASOOLIL LAAHE ASSALAAMO A'LAA NABIYYIL LAAHE ASSALAAMO A'LAA HABEEBIL LAAHE ASSALAAMO A'LAA SAFIYYIL LAAHE ASSALAAMO A'LAA NAJIYYIL LAAHE ASSALAAMO A'LAA MOHAMMADIBNE A'BDIL LAAHE SAYYEDIL AMBEYAAA-E WA KHATAMIL MURSALEENA WA KHEYARATIL LAAHE MIN KHALQEHI FEE ARZEHI WA SAMAAA-EHI ASSALAAMO A'LAA JAMEE-E' AMBEYAAA-EHI WA ROSOLEHI ASSALAAMO A'LAA E'BAADIL LAAHIS SAALEHEENA ASSALAAMO A'LAYKA AYYATOHAR ROOHUZ ZAAKEYATO ASSALAAMO A'LAYKA AYYATOHAN NAFSUSH SHAREEFATO ASSALAAMO A'LAYKA AYYATOHAS SOLAALATUT TAAHERATO ASSALAAMO A'LAYKA AYYATOHAN NASAMATUZ ZAKIYYATO ASSALAAMO A'LAYKA YABNA KHAYRIL WARAA ASSALAAMO A'LAYKA YABNAN NABIYYIL MUJTABAA ASSALAAMO A'LAYKA YABNAL MAB-O'OSE ELAA KAAAF- FATIL WARAA ASSALAAMO A'LAYKA YABNAL BASHEERIN NAZEERE ASSALAAMO A'LAYKA YABNAS SERAAJIL MONEERI ASSALAAMO A'LAYKA YABNAL MOAYYATE BIL-QUR-AAANE ASSALAAMO A'LAYKA YABNAL MURSALE ELAL INSE WAL JAAAN-NE ASSALAAMO A'LAYKA YABNA SAAHEBIR RAAYATE WAL-A'LAAMATE ASSALAAMO A'LAYKA YABNASH SHA-FEE-E' YAWMAL QEYAAMATE ASSALAAMO A'LAYKA YABNA MAN HABAAHUL LAAHO BIL-KARAAMATE ASSALAAMO A'LAYKA WA RAHMATUL LAAHE WA BARAKAATOHU ASH-HADO ANNAKA QADIKH TAARAL LAAHO LAKA DAARA IN-A'AMEHI QABLA AYN YAKTOBA A'LAYKA AHKAAMAHU AW YOKALLEFAKA HALAALAHU WA HARAAMAHU FA-NAQALAKA ELAYHE TAYYEBAN ZAAKEYAN MARZIYYAN TAAHERAN MIN KULLE NAJASIN MOQADDASAN MIN KULLE DANASIN WA BAWWA-A-KA JANNATAL MAAWAA WA RA-FA-A'KA ELAD DARAJAATIL O'LAA WA SALLAL LAAHO A'LAYKA SALAATAN TAQARROBEHAA A'YNO RASOOLEHI WA TOBALLEGHOHU AKBARA MAA-MOOLEHI ALLAAHUMMAJ-A'L AFZALA SALAWAATEKA WA AZKAAHAA WA ANMAA BARAKAATEKA WA AWFAAHAA A'LAA RASOOLEKA WA NABIYYEKA WA KHEYARATEKA MIN KHALQEKA MOHAMMADIN KHAATAMIN NABIYYEENA WA A'LAA MAN NASALA MIN AWLAADEHIT TAYYEBEENA WA A'LAA MAN KHALLAFA MIN I'TRATEHIT TAAHEREENA BE RAHMATEKA YAA ARHAMAR RAAHEMEENA ALLAAHUMMA INNEE AS-ALOKA BE-HAQQE MOHAMMADIN SAFIYYEKA WA IBRAAHEEMA NAJLE NABIYYEKA AN TAJ-A'LA SA'YEE BEHIM MASHKOORAN WA ZAMBEE BEHIM MAGHFOORAN WA HAYAATEE BEHIM SA-E'EDATAN WA A'AFEYATEE WA OMOOREE BEHIM MAS-O'ODATAN WA SHO-OONEE BEHIM MAHMOODATAN ALLAAHUMMA WA-AHSIN LEYAT TAWFEEQA WA NAFFIS A'NNEE KULLA HAMMIN WA ZEEQIN ALLAAHUMMA JANNIBNEE E'QAABAKA WAM-NAHNEE SAWAABAKA WA AS-KINNEE J ENAANAKA WAR-ZUQNEE RIZWAANAKA WA AMAANAKA WA ASHRIK LEE FEE SAALEHE DO-A'AA-EE WAALEDAYYA WA WULDEE WA JAMEE-A'L MOA-MENEENA WAL-MOA-MENAATIL AHYAAA-A MINHUM WAL-AMWAATA INNAKA WALIYYUL BAAQEYAATIS SAALEHAATE AAMEENA RABBAL A'ALAMEENA. ASSALAAMO A'LAYKUM YAA SHOHADAAA-O YAA SO-A'A-DAAA-O YAA NOJABAAA-O YAA NOQABAAA-O YAA AHLAS SIDQE WAL-WAFAAA-E ASSALAAMO A'LAYKUM YAA MOJAAHEDOONA FEE SABEELIL LAAHE HAQQA J EHAADEHI ASSALAAMO A'LAYKUM BEMAA SABARTUM FA-NE'MA U'QBAD DAARE ASSALAAMO A'LAYKUM YAA SHO-HADAAA-O KAAAFFATAN AAAMMATAN WA RAHMATUL LAAHE WA BARAKAATOHU. Ismail, was the elder son of Imam Jafar Sadiq (a.s.). Some Shias considered him as the seventh Imam. This sect is known as Ismailis, although the deceased himself had belief in the Imamate of his brother, Imam Musa Kazim (a.s.). Imam Kazim (a.s.) also respected him. ASSALAAMO A'LAA JADDEKAL MUSTAFAA ASSALAAMO A'LAA ABEEKAL MURTAZAR REZAA ASSALAAMO A'LAS SAYYEDAYNIL HASANE WAL HUSAYNE ASSALAAMO A'LAA KHADEEJATA UMMIL MOA-MENEENA UMME SAYYEDATE NESAAA-IL A'ALAMEENA ASSALAAMO A'LAA FAATEMATA UMMAL A-IMMATIT TAAHEREENA ASSALAAMO A'LAN NOFOOSIL FAAKHERATE BOHOORIL O'LOOMIZ ZAAKHERATE SHO-FA-A'AA-EE FIL AAKHERATE WA AWLEYAAA-EE I'NDA A'WDIR ROOHE ELAL E'ZAAMIN NAKHERATE A-IMMATIL KHALQE WA WOLAATIL KHALQE ASSALAAMO A'LAYKA AYYOHASH SHAKSUSH SHAREEO ISMAA-E'ELUBNO MAWLAANAA JA'FARIBNE MOHAMMADENIS SAADEQIT TAAHERIL KAREEME ASH-HADO AN LAA ELAAHA ILLAL LAAHO WA ANNA MOHAMMADN A'BDOHU WA MUSTAFAAHO WA ANNA A'LIYYAN WALIYYOHU WA MUJTABAAHO ANNAL IMAAMATA FEE WULDEHI ELAA YAWMID DEENE NA'LAMO ZAALEKA I'LMAL YAQEENE WA NAHNO LE-ZAALEKA MO'TAQEDOONA WA FEE NASREHIM MUJTAHEDOONA. ASSALAAMO A'LAYKE YAA UMMA RASOOLIL LAAHE ASSALAAMO A'LAYKE YAA UMMA SAFIYYIL LAAHE ASSALAAMO A'LAYKE YAA UMMA HABEEBIL LAAHE ASSALAAMO A'LAYKE YAA UMMAL MUSTAFAA ASSALAAMO A'LAYKE YAA MURZE-A'TA RASOOLIL LAAHE ASSALAAMO A'LAYKE YAA HALEEMATAS SA'DIYYATE FA-RAZEYAL LAAHO TA-A'ALAA A'NKE WA ARZAAKE WA JA-A'LAL JANNATA MANZELAKE WA MAAWAAKE WA RAHMATUL LAAHE WA BARAKAATOHU. ASSALAAMO A'LAYKOMAA YAA A'MMATAY RASOOLIL LAAHE ASSALAAMO A'LAYKOMAA YAA A'MMATAY NABIYYIL LAAHE ASSALAAMO A'LAYKOMAA YAA A'MMATAY HABEEBIL LAAHE ASSALAAMO A'LAYKOMAA YAA A'MMATAYIL MUSTAFAA RAZEYALLAAHO TA-A'ALAA A'NKOMAA WA JA-A'LAL JANNATA MANZELAKOMAA WA RAHMATUL LAAHE WA BARAKAATOHU. يا وجيهة عند الله ، اشفعي لنا عند الله ، وصلى الله على محمد وآله الطيبين الطاهرين .